When Laci Hargrove turned 16, she was a sophomore in high school with nowhere near the credits she needed for her grade level. She had once planned to graduate with her class by the age of 17. But her young life had taken a few twists and turns and she started to slide behind. Then she dropped out for an entire year to have a baby. When she was ready to return to school, she didn’t want to sit in sophomore-year classes. So last August, Hargrove, now 18, opted to move into a “school-monitored” high-school equivalency program, a new option now available through a handful of high schools in New Orleans. From its offices not far from downtown, the nonprofit Youth Empowerment Project (YEP) has begun a pilot program for under-credited, over-age students like Hargrove. Instead of dropping out and waiting months or even years to re-start their education, they can move directly into YEP’s classes and start prepping for a high-school equivalency test right away, without ever officially dropping out. Across Louisiana, students who fail to complete school can take the High School Equivalency Test, or HiSET, which has replaced the General Equivalency Diploma (GED) in more than 20 states. But most don’t take the test immediately after dropping out. In New Orleans, the large number of dropouts who lack HiSET credentials drives the astronomically high count of so-called “opportunity youth.” About one in six 16- to 24-year-olds are neither working nor in school, according to Tulane University’s Cowen Institute, which in 2015 calculated the city’s rate of opportunity youth at 18 percent, one of the highest in the nation. In a number of states, including Louisiana, adult education — which ranges from basic literacy to vocational training to high-school equivalency testing — is lumped with technical and community colleges, separate from the K-12 system. Until 2017, New Orleans high schools had no internal options to help students who fell so far behind a conventional diploma seemed impossible. Laci Hargrove, a high school student working on her high school equivalency test. There were state incentives in place, however. For roughly a decade, Louisiana asked for, and received, permission from federal education officials to reward high schools that followed up with at-risk students. The YEP program makes the incentives more attainable, by incorporating several existing state policies into a brand-new framework. The resulting program allows at-risk students to stay enrolled in high school while they study for, then take, the HiSET – at no cost to the student. Under the state’s accountability system, Louisiana high schools can receive 100 points for every student who graduates with a diploma and 25 points for each departing student who fails to earn a diploma but passes the HiSET by October of the following year. For each student who drops out, high schools earn a zero. In the past, some have viewed Louisiana’s accountability incentives with caution, fearing schools may sit back, knowing that they can push low-performing students into a high-school equivalency program and earn 25 points. The alternative is riskier: digging in earlier to help lagging students achieve a diploma, but risking a zero score if they fail. In 2013, federal officials scrutinizing the system took a second look at Louisiana, to be sure that the state’s high-school-equivalency attainment was “not masking low graduation rates and that students are not being pushed into a GED [HiSET] track.” Research shows that educational tracking — placing students in lower-achieving pathways — can harm students and constitute a form of segregation: African American and Latino students are disproportionately assigned to lower tracks. But Louisiana has never counted HiSETs toward graduation rates, said school officials, who believe the small 25-point incentive built into the accountability process rewards schools that stick with students and help them get a HiSET. “Otherwise, what reason is there, beyond humanitarian reasons, to continue to focus on that student?” said state Superintendent John White. Roughly 18 percent of all 16- to 24-year-olds in New Orleans are neither working nor in school. Still, that small incentive may not have been enough without a partner program to connect high schools with adult education. Records show that, over the past few years, the Louisiana Department of Education has given out remarkably few 25-point awards for students passing the HiSET within the required timeframe. In 2016 schools earned the 25-point incentive for a total of only 41 students citywide; the 2017 total was worse, a mere 17 students. That data matches what YEP instructors have heard anecdotally: Students who drop out, even those who eventually take the HiSET, often become completely disengaged from education, sometimes for years. The idea now is to cut that time to zero whenever possible. “We want to stop that disconnection, catch them before they become opportunity youth,” said Jerome Jupiter, the former schoolteacher who heads up YEP’s educational arm, which combines tutoring with case management. YEP got its start in 2004 as a re-entry program for teens involved in the juvenile-court system. Its founders — a lawyer, a social worker and a teacher — launched the educational arm a few years later, in the wake of Hurricane Katrina. Countless students had returned to the city only to find that the high schools they’d left were either shuttered or lacked available seats. Then, several years ago, YEP paired with a local high school, Cohen College Prep, to create a program focused on preventing drop-outs. Funded by a three-year grant from the local Baptist Community Ministries, YEP’s mission was to optimize educational opportunities for three groups of Cohen students: 1) those who could graduate on time once attendance or behavior problems were addressed; 2) those who simply needed to recover credits to graduate on time; and 3) those who were over-age and under-credited and at highest risk of dropping out. The goal with the first two groups was to help them earn a traditional diploma, if possible. For the third group, YEP stepped in to provide one-on-one educational work, student supports, tutoring through the HiSET, and help planning for the future. At the end of the three-year program, participants concluded that the third group, which was the most disengaged from school, would do better at an independent, off-campus site. Last fall, YEP staff set up shop to provide HiSET-prep for at-risk New Orleans high-school students — before they became dropouts — within its Central City campus, housed within a grand historic bank-building that seems appropriately academic in appearance. She loved days at Mary McCloud Bethune Elementary School, which she attended from kindergarten through eighth grade. She adored the principal, Mary Haynes-Smith. Coming from that intimate environment, ninth grade at a strict “no-excuses” charter high school felt foreign. “They were always talking to me about my hair, which I’d dyed golden blonde.” Her nose-ring wasn’t allowed. No lipstick. The dress code went beyond the cosmetic: Even if the drafty old building felt cold, she couldn’t wear a jacket. It didn’t help that, as she started high school, she was experiencing some instability at home. “I started clicking out,” Hargrove said. She started sleeping in, racking up tardies. Sometimes, she would skip school altogether. Her grades took a nosedive. She couldn’t see a way back up. Hargrove transferred to another school. But, since she had fallen behind, she felt increasingly defiant, hung out with the wrong crowd, and played hooky more often, sometimes with a boyfriend. Looking back, she shakes her head. “I wish I never was a teenager,” she says. Related: A New Orleans summer teaching fellowship is wooing young black teachers — but is it enough? Principals across the city see this pattern repeatedly with over-age students. “Lack of self-esteem and depression can really kick in. It takes an emotional toll,” said Jamar McNeely, who leads the Inspire Nola charter network, which includes two high schools. Emotional support, however, was scarce for Hargrove. She recalled only one time that a teacher reached out to her about her attendance. A favorite civics teacher pulled her aside and told her that her schoolwork was academically strong. “If only you were here,” he said. That comment stayed with her. She pledged that she’d do better. But then her pants started getting tight. She realized she was pregnant. She tried to stay in school, but she was miserable during the hour-long bumpy bus rides to and from school. With experience acquired over the last 12 years, YEP’s teachers and case managers are familiar with factors that lead students to their doors. “They’ve either been suspended or expelled. They’re behind in a traditional school setting. They’re either pregnant or parenting,” said Jessica Irving-Marin, a licensed clinic social worker and program director for YEP’s new effort. For its pilot year, YEP has partnered with five schools. Increasingly, partnerships like these are creating new links between high schools and adult education nationwide. Yet each program puts its own provincial spin on the model. “Education is so locally driven, driven by local needs and barriers,” said Kisha Bird, director of youth policy for the Center for Law and Social Policy (CLASP). Differing governance between K-12 and adult education systems also make it difficult to replicate models across state lines. Yet the fledgling YEP program in Louisiana shares key program elements with other states, said Bird, as she rattled off a list: There is the program in Connecticut, run for a school district by a nonprofit, that provides wraparound services; the 24-hour online tutoring program in St. Louis that is run through a workforce system; programs in Washington in which state funding follows students wherever they go; and a community-school partnership in Los Angeles that provides youth instruction in many neighborhoods. A Philadelphia network also provides a range of alternative pathways to youth through community-school partnerships. Hargrove landed at YEP in August. Since then, six other students have joined YEP’s pilot program from four partner schools, which are working closely with YEP to iron out wrinkles before the program expands next year. YEP receives some funding for its tutors and support services through a memorandum of understanding with each originating school. To make that happen, students maintain enrollment in their high school, though they attend no classes there. At YEP, teachers adhere to state standards for children enrolled in school and keep careful records — they report attendance, progress, and grades to the originating high school. Still to be determined is how to best address public-school requirements such as end-of-course exams, special-ed Individualized Education Programss, and seat time. Schools Superintendent White believes that connecting high schools and HiSET programs funnels more resources to kids like Hargrove. “It also allows the school she was originally assigned to get a chance to do the right thing by her,” he said. Before students are allowed to enroll in YEP, they sit down with Irving-Marin, to make sure a traditional diploma really isn’t possible. “We don’t want to coach people off a high-school diploma track,” she said. If YEP is indeed the right fit, the student moves into orientation. After an academic assessment, using the Test of Adult Basic Education, or TABE, Irving-Marin asks students about barriers holding them back, and about goals five or 10 years in the future. “One of the first questions I ask is, ‘What are you thinking of doing after you get your HiSET?’” she said. After that initial sit-down, she and her students map out individualized plans, which change as the student masters each topic and moves closer to being ready to take the actual test. Students who pass the HiSET stay in YEP, working with its post-secondary transition coordinators, who walk them through college financial-aid paperwork and course schedules, to determine what’s possible, given work schedules, daycare, academic abilities, financial aid, and transportation. Students coming to YEP directly from high school participate in small classes of 15 with other HiSET students who are at the same academic level. Beyond the seven students who are part of the pilot, YEP’s classes include students in their late teens and early 20s returning to education after being disengaged, young parents wanting to earn more for their families, and young adults and teens referred to the program from social-service agencies. Each week, students receive instruction in all five HiSET subjects: math, language, reading, social studies, and science. Each class has an instructor and a para-instructor. Everyone gets frequent feedback and one-on-one attention, said Irving-Marin, noting that the para-instructors are often graduates of YEP who serve as both mentors and peer coaches. Personalized attention — “a connection with a competent, caring adult” — and long-term planning are key hallmarks in programs like these, said Betsy Brand, of the American Youth Policy Forum, which has been studying the ways in which alternative education works best. “In today’s world, a GED alone doesn’t have much value, unless it’s connected to higher ed,” Brand said, adding that schooling may not always be continuous, since students often step away from adult-education programs for six months or a year to work full time or deal with a hectic challenge. “What makes them return [to get their HiSET or a bachelor’s degree] is the personal connections that have been made at a program,’ she said. Those personal connections have made all the difference to Hargrove. “They take me to the doctor; they offered to help me with money for my daycare when I needed it. Sometimes they take me to IHOP. They show me that they care,” she said. Through Work and Learn programs, working at a YEP-owned thrift shop and bike shop, she’s been able to earn some money and get on-the-job training. She can also bond with people in similar situations, like Judge Evans, a graduate of YEP’s Design Works who took the photos for this story. Altogether, the support allows Hargrove to focus, she said, and that shows in her grades: she has been doing extremely well, academically. 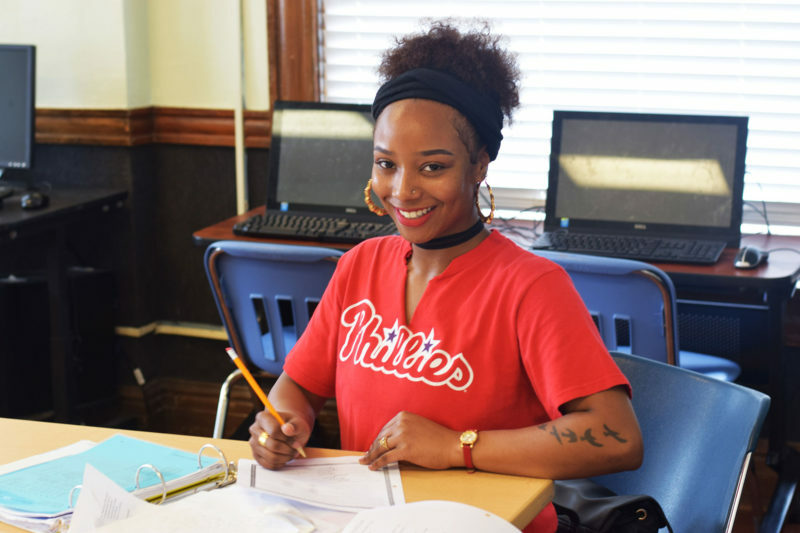 Last month, Hargrove began looking at colleges — getting her bachelor’s degree is part of the long-range, individualized plan she created with Irving-Marin at YEP. And every morning, she gets up, gets Joshua ready and puts on her backpack, like the devoted student she’s become. “Rain, sleet, or snow, I’m going to be here,” she said. This story was produced by The Hechinger Report, a nonprofit, independent news organization focused on inequality and innovation in education. Sign up for our newsletter. I loved the March 5th article, "Getting a GED while still enrolled in high school". High school has benefits, such as preparing kids to work together on projects even when they aren't friends. But every child is unique, and a few of them need an alternative. My very gifted and driven stepdaughter suffered severe anxiety attacks from age 13-15 attending public school. Shortly after turning 16, she dropped out of high school in May/June and took the GED in July so she could begin college in August. We are thankful that she had this option, as another 2 years in public high school may have defeated her self esteem and enthusiasm for learning.